Didn't know Kobe was number one before yesterday, but the guy at the bottom doesn't surprise me. Only confirms once again how disgraceful, pathetic, and cake walk the majority of his competition has been. This is a pretty damn impressive list though when you look at all the other names included as well. I guess you could say that Kobe's arguably had one of the most, if not the most toughest road legacy-wise. That's gotta hold some kind of value. West always has better teams. So this is expected. Are they not counting Centers? You gotta think Shaq and KAJ would be somewhere between Magic and Timmy on this list. Edited by lakerfan98, May 28, 2015 - 06:38 AM. I would imagine they chose to show ase players that are often used to compare Lebron to. Timmy is the only big man that gets some love since most players they mentioned are wings, he probably was used just because he beat Lebron twice so it was for comparison. Edited by PhillyLaker24, May 28, 2015 - 06:48 AM. amazing they did that individually without a team or coach; that's one impressive espn stat! I'm surprised to see this stat on an ESPN network. Read somewhere else shaq would be at 17. Normally a lot of these stats you see where it's like "The 1st NBA player to get 23 points, 14 rebounds and 11 assists on 55% shooting at an away game when his mom wasn't there since 1970" are pretty dumb. This one says volumes, IMO. 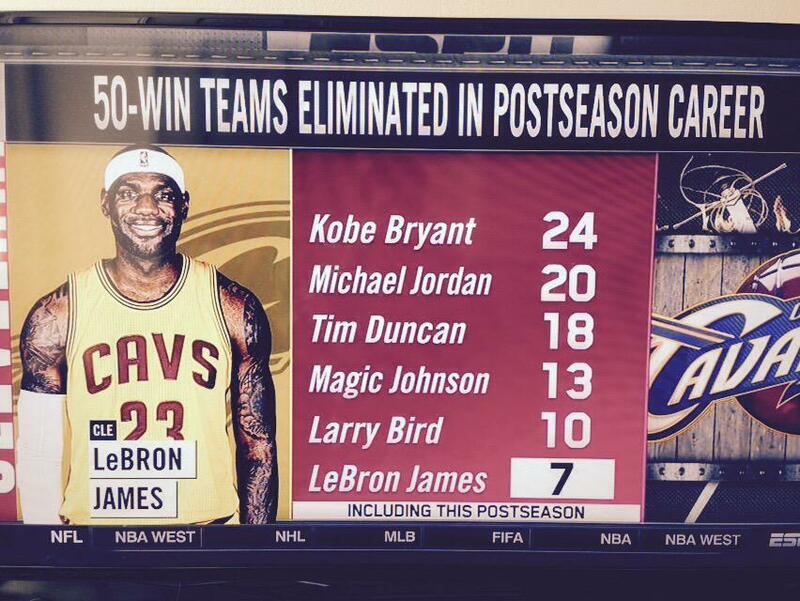 LeBron is amazing...no doubt, but the competition he has faced does not compare to other greats. Edited by JGuez, May 28, 2015 - 08:24 AM. I guess since Kobe leads in this pointless stat that there needs to be a post about it. I'm surprised that the media is actually bashing their golden child, Lebron James..
You have to understand how much harder those seven teams were though. Edited by Disaster in Paradise, May 28, 2015 - 09:58 AM. No why would I be I loved that he did that for us in the past. I see it as a defining factor towards just how difficult an individual players path was towards a ring. I guess since this is a Kobe thread, there needs to be a pointless, ignorant, and baseless post from you. Did Kobe sleep with someone in your family? The East is pitiful, my word.